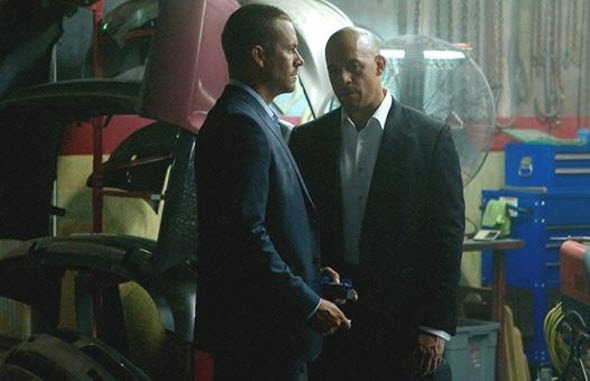 The last news, which we shared with you about the upcoming Fast & Furious 7 film, told that the movie had been finally shot, and now we’d like to rejoice you with a couple of fresh blockbuster’s photos. Yesterday, Vin Diesel - the actor who has played one of the leading roles in the movie - published two new Fast & Furious 7 photos in his Facebook account. On the fresh pictures, Diesel himself and Paul Walker - Vin's friend and the performer of the leading role in the upcoming movie, who tragically died last autumn, - are depicted. On his page in Facebook, Diesel has written that the employees of Universal Pictures came to visit him and show the official Fast & Furious 7 trailer, which, according to the actor, left him speechless and was really incredible. So far, neither on the official movie’s video channel in YouTube nor on the Universal Pictures’ one, this new Fast & Furious 7 trailer hasn’t been published, but we hope that soon we also be able to watch it. And while we are waiting, we offer you to look at fresh and really amazing Fast & Furious 7 photos, published below. We’d like to remind you that Fast & Furious 7 film will hit cinemas in April 2015, and on the big screens, we’ll be able to see not only Vin Diesel but also Dwayne Johnson, Michelle Rodriguez, Lucas Black, Jason Statham, Elsa Pataky and many others. Do you anticipate Fast & Furious 7 film? Will this blockbuster be really interesting without Paul? Your answers are always welcomed at the bottom of the page.